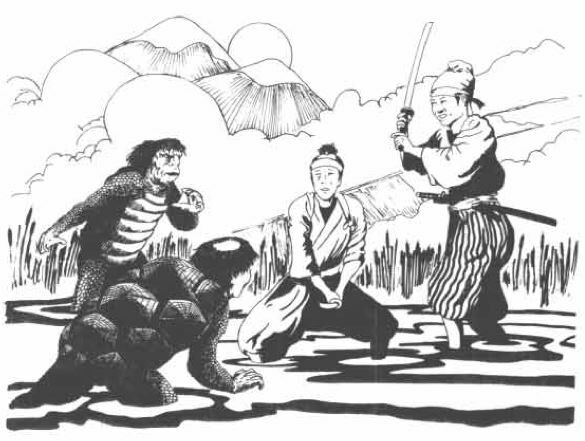 I love old RPG black & white line art. A lot. And this one is so evocative of the Fantasy Nippon that is the central setting for the FGU classic Bushido. I’ve never actually played it, sadly. But damn if the art doesn’t make me want to. Of course, Bushido’s system is, like much from FGU, a bit thick, so I don’t think I’d be likely to use it to scratch my samurai itch. In fact, I’ve been tinkering (well, I was tinkering, I’ve mostly stopped now) with a Barbarians of Lemuria-powered semi-Bushido. BoL seems like a good system for some chanbara action (really, of course, it’s a great system for any action), after all. So, sticking with the finding inspiration thing I’m rocking right now, here’s a quick writeup for the Kappa as a BoL critter. Kappa are malign water spirits who resemble ugly little men covered in scales, often (though not always) with turtle-like shells covering their backs. They have a small, bowl-shaped depression on their heads that holds a small amount of water from their home lake, pond or river. If the Kappa can be tricked into spilling this water it will flee immediately to return to its lair. A waterless Kappa’s attributes are reduced to -1 and it will die within 3 days if it cannot return to its home to refill its head basin. Kappas are masters of Koppo, a bone-breaking technique. If they score a Mighty Success when brawling they may elect to afflict their target with a broken bone. Damage done as a result of this injury may not be “shaken off” (BoL LE p. 39) nor may it be included in the 1/2 LB recovery after a combat (BoL LE p. 10). 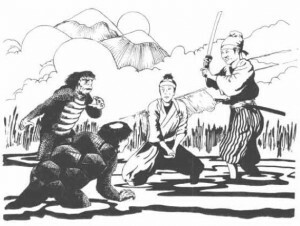 However, the damage done by a Koppo attack does not receive the normal +1d6 associate with a Mighty Success, though it is still set at the maximum damage for the attack (i.e., the attack does 5 points rather than 5 +1d6). Kappa are minor magicians, but any spells they cast must relate in a significant way to water. As spirit beings they are also able to draw upon their connection to the water to use Fate Points to grant water-themed boons or flaws. All Kappa love cucumbers and an offering of such will go a long way towards easing any encounter with them. This entry was posted in Art, Barbarians of Lemuria, BoL Bestiary, Monsters on September 3, 2010 by the venomous pao. BOL can do anything. I’m convinced of that. How would you handle careers in a Bushido setting, though? It seems like if someone’s a Yakuza or a Samurai then that’s about it. Actually, that’s one of the reasons I like a non-class system for these things. I prefer my characters to have a bit more breadth and I think BoL lets you do that without drowning you in options, skill lists, and so on. So, after monkeying around with trying to come up with specific careers – ones directly tied to the professions in Bushido – I decided that the better thing to do was stick with the core BoL careers (perhaps supplemented with some from BotA where necessary) and have the blend of the players’ career choices determine what “class” they were. Meanwhile, a character with careers in Rogue and Merchant would be Yakuza while one with careers in Rogue and Assassin would be a Ninja. And, of course, Magician and Priest careers just link up to Shugenja and Gakusho directly. Obviously, using BoL for a chanbara setting it going to give is something of a pulp feel and less of a strict “Yakuza are yakuza; Samurai are samurai. That’s it” feel. Personally, I prefer that looseness, but I can understand that other folks would find it counter to the setting. I’d actually like to see a player who wants to be a Samurai who isn’t very good at the samurai-y stuff but is a bit of a thief, and BoL can handle that. But again, that’s clearly not for everyone. Choice of Boons & Flaws would also help tie the BoL character to a Bushido concept. I was knocking out a list of the various Bugei as Boons (not exactly revolutionary, but it was the best match) to help with the flavor. So a character with careers in Warrior and, say, Peasant, who took Atemi-Waza and/or Jujutsu as boons would probably be considered a Budoka. Though again, working with the player to ID what he or she wants to play and how best to hit that mark with the rules is key. An elegant solution! Resists the urge to get too fiddly, and I like the depth the “mix” adds. So an aesthetic, pen-wielding samurai might have a rank or two in minstrel and scribe, as well as soldier. I’d like to see how you incorporate Bushido’s rules for zanshin . . .
You know, I hadn’t looked at the zanshin yet. That’s the kind of thing that in pulp-ifying the setting and streamlining the rules I’m inclined to let go. But if I get back to tinkering with this I’ll make sure to give zanshin renewed consideration. It’s been years since I had the Bushido rulebooks in my mitts, but if I recall correctly Zanshin was an abstraction of a warrior’s “correct” mental state. Rules-wise, it translated to how many actions a warrior could take per phase/round/combat turn/whatever. Definitely a rules-concept I’d skip in streamlining Bushido into pulpy form. And, as noted, I’ve never actuall played Bushido before, despite a strong desire to. But I do have the PDF of the rules from RPGNow (and I plan to order the reprint that FGU has available now). In any case, a quick look at the rules confirms your recollection. Zanshin essentially determines if the character has the mental acuity to make the most of multiple actions. And I’m pretty sure that makes it worth skipping in a more relaxed and pulpy take on Bushido. Still, I really will keep it in mind when (if) I get back to this in detail. I am going to hit all of your recent BoL posts here, including Astrid. Awesome. My interest in BotA really flagged having to wait for the print version (although I did crack and buy the pdf), and I really like Sorcery & Super Science!, yet you have me leaning towards BoL again for quick fantasy when we aren’t playing LL/AEC for fantasy. I hope to see a pdf of these and I should collect my BoL stuff (like the fantasy races and treasures and throw it together as well). Keep going, squire, you are on a fantastic roll! Mille grazie, as hey say in Roma, my friend. Waiting for the print version of BotA was hard, but I was awfully glad when I finally got to pick up a copy. It really is gorgeous to behold. I admit to being very interested in S&SS!, I just wish my local store had a copy I could flip through. I’ve held off buying the PDF so far, just because I’m already drowning in systems I’m not getting to use enough. But I did download the quickstart and I find the system… intriguing. Have you had a chance to give it a proper go? I think I prefer the BoL/BotA system as a whole. But again, it tempts me. There is a free pdf, The House of Blue Men, that has a lot of the core rules in it, which will give you a great idea of how the game is run. I wrote another human variant race for that game that are like the Judge Dredd judges and the Adeptus Arbites from Warhammer 40K combined. I checked that out and liked it, but I’m still not entirely sure about the system. I feel like to play it right I’d need to go out and buy one of the Gamescience packs with the d14 and d16. Otherwise there’s a great big gap in there b/w d12 and d20. Anyway, it’s definitely tempting. And I appreciate what JGB is doing over at his blog with all the additional material. Is your variant human race up somewhere? I’m not seeing it at Ancient Vaults (though I could just be blind/tired/not looking hard enough). 2d8, chum, 2d8. You just reminded me that I need to pdf-ize the vat-born men. Ah, but then you’re switching to a curve rather than an even distribution, for that level of challenge only. And though I’m neither a math geek nor cripplingly neurotic, I find that annoying. If all of the challenge levels were bell curves, no problem. And if none of them are (i.e., I buy a d14 and a d16), no problem. But having 14 remain uncovered and 16 having a different distribution, man, I can’t take it!